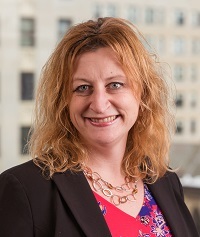 The Wisconsin Economic Development Corporation (WEDC) and the University of Wisconsin System (UWS) today announced that Rebecca Deschane has been named talent initiatives director, a new position that will lead and coordinate statewide efforts to attract and retain talent for both organizations. Deschane, WEDC’s legislative liaison since 2011, has been an integral part of WEDC’s efforts to identify and develop various talent initiatives. She serves as the primary contact for WEDC’s engagement with the young professional organizations across the state and has worked with NEWaukee to launch and expand YPWeek, a statewide initiative aimed at attracting and retaining young talent in Wisconsin. Deschane also led an internal task force on talent retention and attraction that developed and coordinated activities across the various divisions at WEDC. Deschane, who was selected after a national search, will work with WEDC and the UWS Office of Economic Development to help align local, regional, and statewide talent and workforce initiatives. She will engage with organizations to provide insight and policy development to support the talent needs of Wisconsin’s businesses. In addition, she will serve as liaison to organizations and institutions seeking to develop and support complementary talent initiatives. A graduate of Marquette University, where she earned a bachelor’s degree in political science, Deschane served as youth development director for the Green Bay Area Chamber of Commerce and as a congressional aide before joining WEDC. The new post is modeled after the economic development liaison position, which has been a shared function of UWS and WEDC since 2012. Through that office, WEDC and UWS have collaborated on numerous initiatives, including the Ideadvance seed fund, the WiSys Technology Foundation, the Research, Economic Development, and Innovation (REDI) Committee of the UW System Board of Regents, UW Career Connect and UW-Madison’s Discovery to Product (D2P). Since the creation of that position, held by UWS Associate Vice President David Brukardt, UWS and WEDC have worked together to attract nearly $8 million in private match funds from U.S. and global partners to support faculty research and campus-based economic development initiatives. The announcement comes as WEDC prepares to a launch a $1 million campaign to attract talent to Wisconsin. A large portion of that initiative will target young people currently living and working in the Chicago area, which is a primary market for Wisconsin’s talent attraction efforts. That campaign also will include having WEDC work with alumni associations of universities and colleges throughout the state to engage with recent graduates, particularly those who have left Wisconsin, to connect these talented young people with the unmatched opportunities Wisconsin offers for professional and personal success. $300,000 for the Department of Workforce Development to create a mobile Job Center that could provide job services and talent recruitment in areas with limited access to permanent services.